Meet Ami Yamato, a Japanese girl living and working in England... Sort of. You might notice something different about Ami, something not quite right. Although she's always shown in the real world in her YouTube videos, she is entirely computer generated and almost never acknowledges her digital nature. More importantly, she's incredibly congenial and fun to watch. There's a lot of painstaking detail in her videos: shaky cameras, out-of-focus shots, poor lighting conditions and more are all taken into account to put this rather unrealistic character in an ultra-realistic frame. Recently I stumbled across the work of Marie Coy on Flickr, and I absolutely fell in love. If you're a regular reader, you may have noticed that my favourite style of Second Life photography is often minimalistic without too many dramatic lighting effects or edits. I like things simple but immaculate, and Marie's work has that in spades. Keep reading to see more, and for a few tips on how to replicate this style yourself! Winning by a wide margin, Marianne McCann's entry is the reader's choice for the Uncanny Valley Expo. 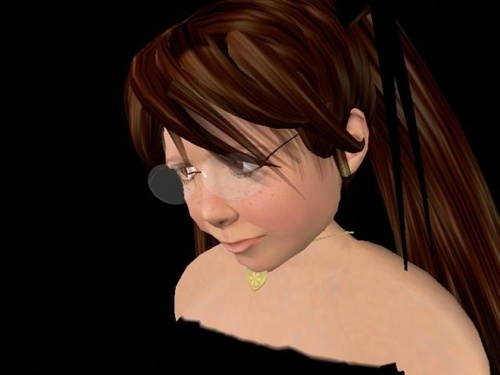 She presents and models her avatar here, which features the "WIA Head Down Little Girl" gesture by Baby Thorne, combined with the Lindens' generic sad expression, and a downcast looked shaped via the Mysti tool. Marianne's skin and eyes are by Robin Sojourner. As it turns out, she made this entry not just to create an avatar who engaged on a human level, but as a kind of public statement over a contentious cultural issue. I'll be posting an interview about that soon, but meantime, congrats to Marianne, who wins a free NWN ad along with runner-up Haver Cole, and a signed copy of the official guide, along with semi-finalists DeltaDharma Dawn, Haley Salomon, and Xellessanova Zenith. Thanks to them, everyone else who submitted, and the nearly 400 readers who voted on the finalists. This Uncanny Valley Expo entry from Haver Cole was chosen 2nd in a vote of nearly 400 readers, and features a pose by Luth Brodie ("Fashion 5") and a skin by D-skin. My personal title for it? "Cameron Diaz Goes Geek". See the semi-finalist entries here; see all the Expo avatars here. - DeltaDharmaDawn, modeling and presenting, "Do you still watch over me?" Her expression is Innocent, from LUTH, her skin is by RAC AMY. She also used a "self-designed personal lighting system to remove face shadows." - Haley Salomon, presenting and modeling a pose from Luth and an R and C skin. - Xellessanova Zenith, modeling and presenting "Go Cry Emo Kid". She used a custom face skin manipulation, custom eyes made bloodshot red, and a custom shape. "I prefer minor tweaks to the face mesh rather than the often over-the-top expression defaults," she explains. To add she added custom eyebrows and animations ("four threaded to run consecutively through a gesture, over a base pose"). Final Uncanny Valley Expo Vote continues! Click here to vote for the avatar which engages you most. Voting ends on the 14th! 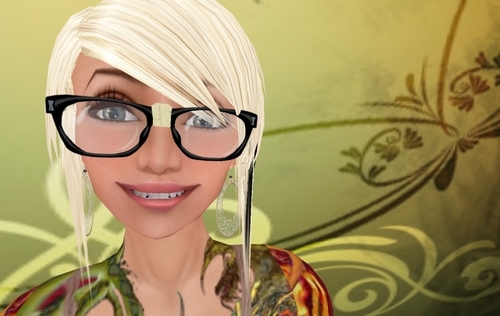 Click through to this link to see and select the avatar who engages you most. Update, 10/27: Watch the results come in at the polling site, with nearly 200 votes registered so far. The nominees are here, and the polls are open! Vote on your selection after the break; polling station is open for the next couple weeks. The Uncanny Valley Expo Finalists! - DeltaDharmaDawn, modeling and presenting, "Do you still watch over me?" - Rodion Resistance, modeling and presenting, "Hey you!!!" - Haley Salomon, modeling and presenting. - Marianne McCann, modeling and presenting, "blog.secondlife.com." - Haver Cole, modeling and presenting. - Young Geoffrion, modeling and presenting. - Saeya Nyanda, modeling and presenting. - Heidi Sturm, modeling and presenting, "Deep in Thought." - Xellessanova Zenith, modeling and presenting, "Go Cry Emo Kid." - Molly Maidstone presenting, Megan Steins modeling.